I often go scrolling, looking for inspirational quotes to use for my groups. And while I was scrolling, I saw this one, "your body is a reflection of your lifestyle. "It seems kind of harsh, or brash but the more I thought of it, the more I agreed. The past year and a half is the first time I have ever made it a point to get my eyebrows waxed regularly, hair cut and colored regularly, and this year I added stop biting my nails and get them done regularly. Before this point, I had never really thought "I deserved it." I never thought, "I can do this for me. I'm worth it to do it." And often though that Only special people pamper themselves often. That is not true. Too many times we put ourselves on the back burner for other people, or family. Especially moms. We put our kids first. But let me tell you you do deserve to be taken care of. Because just like in an airplane you have to take care of yourself first before you can help others. And taking the context of this picture to the health and wellness side of it. It is also true. The less active we are and the more high calorie, fatty, greasy, sugary, fast and cheap foods we eat, the more the body will gain. This is personally what led me to gain my weight. Crap food and no exercise. Keep in mind right now though, I exercise often, but where I lack in my control and 100% commitment or even sometimes 80% commitment, is my eating. This is why my body is strong but it is still holding onto some fat. I know where I struggle with that, and I know that if I just went in 100% I would lose the weight so fast...but that is not what I am trying to do. I am developing a healthy lifestyle. I am not dieting or following a strict plan. Which means my progress is going to take longer than expected. But that also means I'm making a lifestyle change and not a fast crash diet. 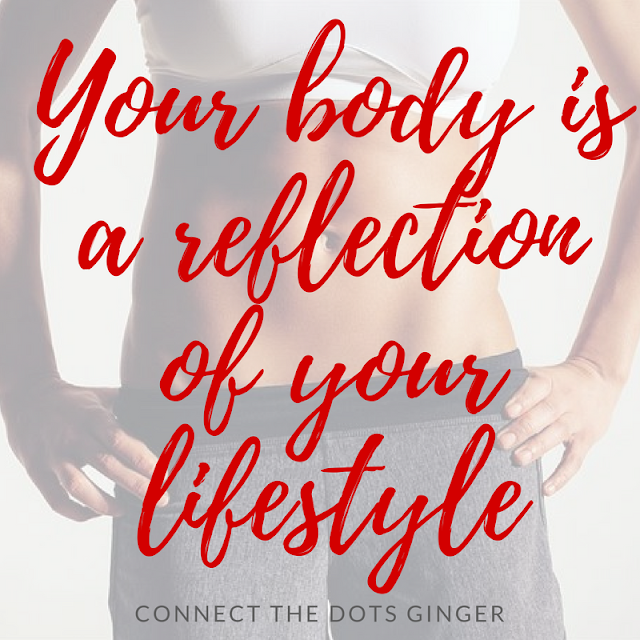 Take time today to think about how your body is a reflection of your lifestyle. In both personal care and health and wellness. Are you making healthier choices? Are you exercising often. Are you choosing to watch tv shows more than take care of you? Are you finding reasons why you can't take care of you? Do you spend a little bit of time just for you each day? Next time you start to beat yourself up over your progress or just think you should be doing something faster than you are, sit back and thing about how far you have come. How much you have changed. Because that is what truly matters. That you are changing your old habits into new healthier ones. And that you remember how amazing you are. And darn it, go get a pedi and mani done, or get your hair cut, or a massage. Do something for you. Budget it into your finances so that there is no excuse why you can't take care of yourself. Schedule it into your calendar and don't cancel at the last moment. You matter. And honestly I have never felt so good both inside and outside because I am taking care of all of me. Not just some of me but all of me!